The easiest way to find all my sites is to put “Melody Lea Lamb” in your internet search. I am one of six kids and was a twin until age sixeen. I grew up in Bakersfield California and went to college at Sonoma State University. I moved to the East Coast and after a bit of struggle, continued my art training at Portland School of Art. I spent about six years as a graphic designer at an advertising firm as well as in a company called Weargaurd where my job was to translate customer’s ideas into a digitizable format for embroidered work clothes. At that point I took a ten year “baby sabbatical” during which time I focused my energy on raising my two beautiful children. 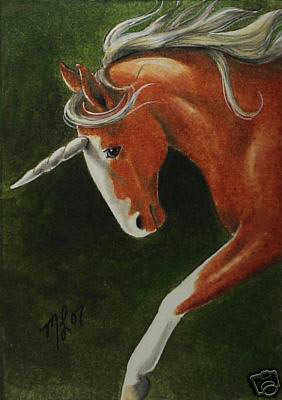 About five years ago, as I was contemplating how to find my way back into the art market, I discovered ACEOs (Art Card, Editions, and Originals) Here is a good explanation of ACEOs. I’ve been painting and selling ACEOs for five years now, and at the risk of sounding too corny, this little art niche has been life changing. I’ve actually built a business that includes seven different selling venues, 10 different sites, a children’s book contract, and over 4000 art items all based on my ACEOs! When did you first start drawing and painting? 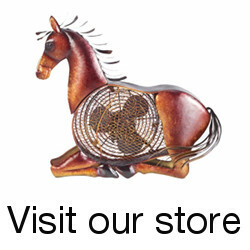 My favorite subject has evolved form my most popular sellers. That would be cute little critters like bunnies, mice, squirrels, and chipmunks. Your pieces convey lots of personality. Do you see the personality in each subject before you paint or does it come to life as you work? A little of both actually. I am first inspired by the animal and then let his personality evolve as I paint him. 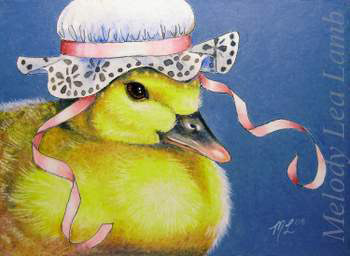 I am most inspired by the artists Andrew Wyeth, Robert Bateman, Beatrix Potter, and Claude Monet. 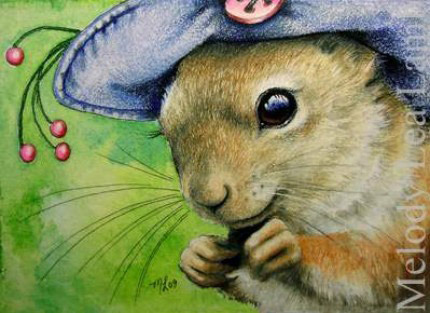 The animal that brings me my greatest joy, is my horse Little Bit, but the little gentle creatures like mice and bunnies also inspire my creations. Hmmm, a secret ritual? Well, I do have a pattern of steps I take when I create a miniature. First I browse through a collection of reference photographs until I find an image that inspires me. Then I try to envision how to make the image more unique and interesting. Lately I have been giving little animals a human quality by putting hats on them and placing them in unusual environments. There are two places that give me great inspiration. One is while I am jogging with my dog and I reach the top of the mountain on a crisp sunny morning. 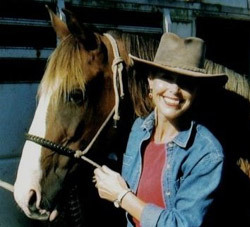 The other is when I am out riding my horse Little Bit on the trail at any time of the year! I believe the Internet has changed the art world tremendously. It has allowed artists to reach viewers around the world in real time and also allows artists to connect with each other for support and inspiration. To be honest, the Internet has changed my experience as an artist dramatically! In fact, I am not sure what level of success I would have had getting back into the art selling world if it were not for the Internet. I actually have been surprised with the delight I find in “tending my garden” of my online art business. I think this is because I am not completely comfortable promoting myself in the “brick and mortar” arena of galleries, etc. but find it a pleasure on the net. 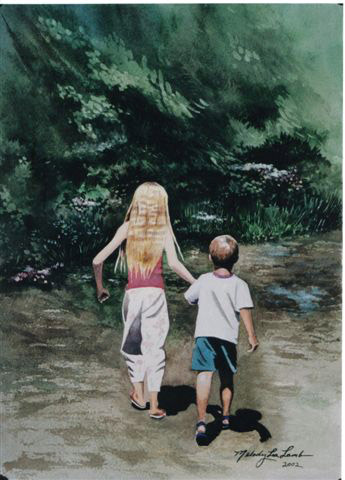 I have a little watercolor I did of my children when they were very young, I believe that may be my favorite piece. My favorite because, of course, the subject and that it is 100% watercolor. I have always found watercolor very challenging. The painting also has a bit of looseness, which I rarely keep in my work. 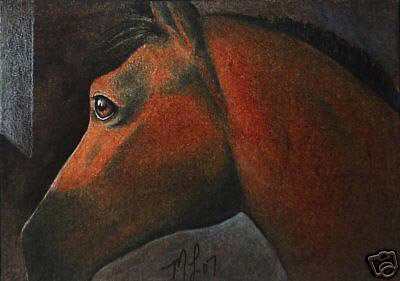 I am passionate about my children, my family, my animals, my horse and being co-leader for the group Art For Critters. I just finished illustrating a children’s book, Moonlight Memoirs due out in a few weeks. I complete at least a new miniature painting every week and right now I’m working on a new style that is more anthropomorphic that in the past. The new pieces have a very fanciful, fantasy feel. Additionally I began another children’s book with the character being a black bunny. Thanks to Melody for answering the interview and sharing her work. Be sure to check out her art website periodically for updates about her latest works. This entry was posted in Interviews on August 7, 2009 by The Equinest. I am so pleased and honored to have been interviewed for The Equinest! Thank you from the bottom of my heart. I really enjoy Melody’s artwork. Her little critters are so heartwarming and have so much personality. Great to read about her success. Wonderful interview. Well rounded and lots of personal interest stories. Melody’s art is perfect for a childrens book. My grandchild will love this one. Her art always goes the extra mile. Thank you for a great article and the images. Excellent!